Stanley Cup dynasties don’t really exist anymore. The days of one team dominating the NHL playoffs appear to be long gone due to parity in the league since the salary cap was introduced. The closest thing to a dynasty lately would be the Pittsburgh Penguins hoisting Lord Stanley’s mug in the spring of 2016 and 2017, the Los Angeles Kings achieving it in 2012 and 2014 and the Chicago Blackhawks pulling off victories in 2010, 2013 and 2015. It’s arguable which of those three feats was the hardest, but Chicago’s trio of league titles in six years under head coach Joel Quenneville tops the list for me. But as George Harrison so famously wrote, “all things must pass.” Quenneville found this out first hand on November 6th as the Blackhawks relieved him of his duties after a 6-6-3 start and the team looked sluggish out of the 2018/19 season’s gate. He may have hung around a little longer if the squad hadn’t missed the playoffs last season and appeared to be in grave danger of doing so again this campaign. The 60-year-old Quenneville, a solid, but unspectacular defenseman in his NHL playing days, took over behind the bench in the Windy City in October, 2008 after being hired as a pro scout by the organization. He’d already helped the Colorado Avalanche win the Stanley Cup as an assistant coach 12 years earlier and was the bench boss of the St. Louis Blues and Colorado Avalanche for a combined 11 seasons before landing in Chicago. So being promoted from scout to head coach a decade ago didn’t really come as a surprise. Quenneville won three Central Division crowns with the Blackhawks along with the three Stanley Cups and missed the playoffs just once in his 10 years there. He went 452-249-96 in 707 regular-season games and posted a 76-52 mark in the playoffs. The man with the most recognizable moustache in today’s NHL has won 890 of his 1,636 regular-season outings, which ranks him second in league history for wins behind the legendary Scotty Bowman. Let’s face it, If Quenneville feels like working again soon he won’t have to wait long to get back on the horse. 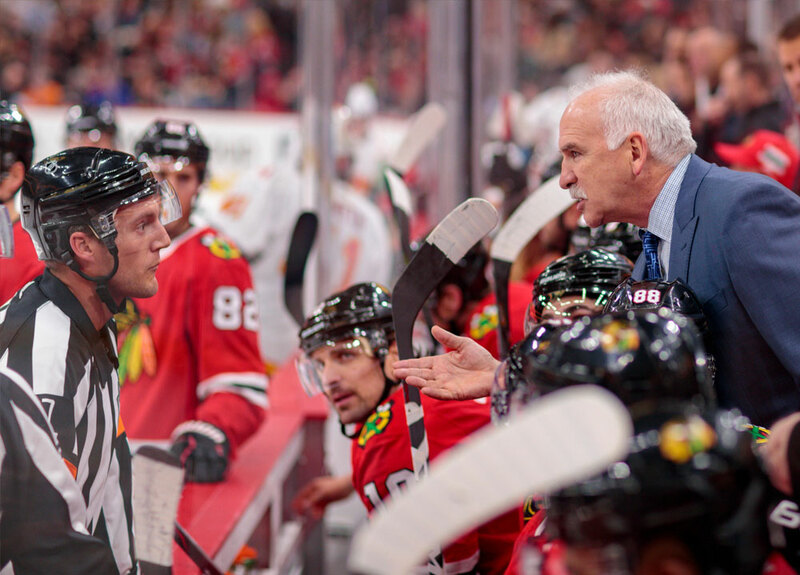 That’s all in the past now though as the Blackhawks have replaced him with 33-year-old Jeremy Colliton, who now becomes the youngest head coach in the league. The Canadian native of Blackie, Alberta played briefly in the NHL as a center with the New York Islanders and christened his coaching career in Sweden with Mora IK in 2014. He stayed there for four years and didn’t move back to North America until 2017/18 when Chicago hired him to take over the reins of their American Hockey League farm team the Rockford IceHogs. Colliton has the reputation of being a fine communicator and Hawks’ president John McDonough and general manager Stan Bowman have both spoken highly of him to the media. He has a tough task on his hands though since this is his first kick at the NHL coaching can and he’s younger than some of his players. He’s been brought in to salvage the season and if Chicago doesn’t make the playoffs his first year will be seen as a failure. Colliton has enough pieces of the roster puzzle to reach the postseason, but will need to get the best out of his players. Let’s not forget this is a team that still features Jonathan Toews, Patrick Kane, Artem Anisimov, Alex DeBrincat, Duncan Keith, Brent Seabrook and Brandon Saad. Colliton will be working with a new assistant coach in Barry Smith though as the Blackhawks also fired assistants Ulf Samuelsson and Kevin Dineen when Quenneville was let go. This means Colliton needs to quickly forge a good working relationship with Smith, who’s twice his age at 66. However, the team’s season is likely to sink or swim depending on how the goaltending tandem of Corey Crawford and Cam Ward performs. Crawford is 33 years old and missed part of last season and the start of 2018/19 due to injuries and Ward is even older at 34. If these two aren’t at the top of their game then it’s going to be hard for the squad to return to the playoffs. If their season does get away from them we may see defensemen Keith and/or Seabrook used as trade bait as they’re now 35 and 33 years old respectively since the hiring of Colliton signals a youth movement for the club. It’s unlikely the core stars such as Kane and Toews will be moved as they’re 29 and 30, still producing, and considered the cornerstones of the franchise. But Quenneville won three cups in a span of six seasons and the club had won just three in 82 years before he arrived so anything’s possible. It’s now up to Colliton to prove the Blackhawks made the right move. His priority should be rectifying the special teams since the power-play and penalty-killing units ranked 27th and 22nd in the league when Quenneville was sacked. He’s also going to need some help from management though. This is a team that saw their payroll rise rapidly with their Stanley Cup wins and the likes of Niklas Hjalmarsson, Teuvo Teravainen and Artemi Panarin were all lost due too financial constraints. $61.1 to just 14 players and six of those have no-movement clauses in their contracts. This means the Blackhawks will have a little more than $18 million left over for the rest of the roster. Colliton needs to produce results as quickly possible while Toews, Kane and Keith are still among the league’s elite players. At least he’s been brought in early enough in the season to turn things around, but Colliton’s going to need a lot of dedication from the players and his bosses to succeed at his new job.